Spent the weekend with the boys at Bandon Dunes, a golf retreat set on the Oregon coast. It was incredible. 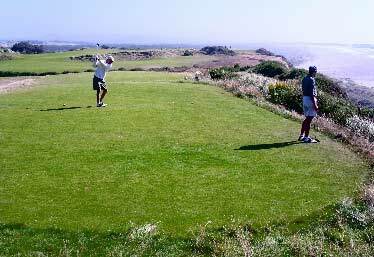 In the Golf Digest 2003-4 survey of greatest public courses in the U.S., Pacific Dunes ranked 6th, Bandon Dunes 9th. 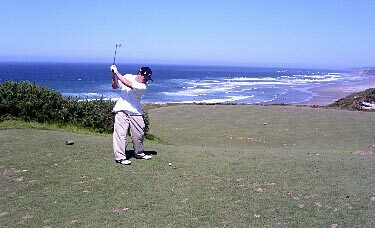 Both are links style courses set along the cliffs lining the Pacific Ocean. 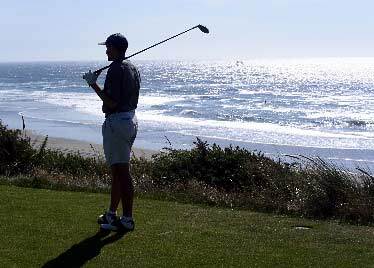 There's not much to do there except golf--no tennis courts, no towns nearby. The practice center is awesome, one of the two or three largest in the world. When we weren't sleeping or eating, we were golfing. The terrain presented lots of new challenges. The soil beneath the grass was like clay, so if you contacted the ground before the ball on your downswing, the ball would go nowhere. That meant that hitting wedges off of the fairway was extremely difficult. Also, the wind along the coast was fierce, so any high shots would be at the mercy of the wind. For those reasons, the head golf pro suggested we just use our putters or 5 woods and roll the ball up onto the green whenever possible. The sand traps were brutal. They resembled deep holes in the ground, and the sand was incredibly heavy. As soon as we arrived on Friday, Bill and I hit the practice center to hit buckets (unlimited balls for visitors staying at the resort--nice!). After hitting some irons, I took out my favorite club, my Ping I3 3-wood. I lined up, waggled once or twice, and unleashed my swing. Tink! The ball rolled about 25 yards to the right. Something didn't feel right. I looked down. The club head was dangling from the shaft like a chicken's head with a broken neck. The shaft had snapped at the hosel. Losing a favorite club is a tragic thing for a golfer. Unlike most weekend hackers who like to purchase new $400 drivers every season, I've only really played two sets of clubs my whole life: the starter set my mom purchased me when I first started in the game, and the new set I purchased recently with dimensions more suited to my strange body measurements (short torso, long arms). I don't like change; the game is hard enough for me without introducing new clubs to break in all the time. Unfortunately, the repair guy at the pro shop didn't handle Pings, so I had to use a loaner. The next morning, during an hour long links lesson, the head pro Grant happened to be doing a Titleist demo day. I told him I'd need a 3-wood for my rounds, and he handed me a demo of the new Titleist 980F 3-wood. Then he asked if I was happy with my driver. I never really hit my driver--it doesn't inspire any confidence in me. I admitted as much, so Grant handed me a demo of the new Titleist 983K and said, "Put this in your bag this weekend." He gave Bill a 983K as well, and nearly convinced John to take one. It's a great marketing idea and I'm surprised more manufacturers don't use it. Ask any weekend golf hacker if he's happy with his clubs, and chances are there's more than one club he wouldn't mind replacing. Before he heads out for a round, grab his driver's license, put a demo in his hands, and tell him to hit it for the round. If he hits well, there's a good chance he'll be handing you a credit card by the end of the round. It was love at first strike between me and the 980F 3-wood. It took me longer to warm up to the 983K, but by my third round at Pacific Dunes I was crushing it long and straight, nearly as long as Bill. I've been lukewarm to these new-fangled titanium drivers with their clubheads as large as a cantaloupe, but now I understand. Chick's dig the long ball, and so do weekend golfers. On one nasty par five into the wind, I hit driver and 3-iron and still found myself 230 yards from the green, shooting over a front-side bunker. I pulled out the 980F, lined it up, and took a swing. It was the greatest 3-wood of my life, flying like a missile just over the bunker and rolling onto the green about 20 feet from the cup. Parting with both clubs at the end of the weekend was sweet sorrow, and I was sadder yet when I checked the prices for those clubs on eBay and online. The courses aren't long in terms of yardage, but they play longer because of the wind. I'd hit huge drives on par fours and still find myself a long-iron or wood from the green because the wind had knocked them down. While there weren't any trees, the course was covered with a nasty shrub called gorse, covered in thorns which contained a toxin which would cause your skin to swell up if pierced. I spent much of the weekend taking huge swings out of sand and tall grass and dirt. The scenery made it all worthwhile. Many approach shots were into greens framed behind by the ocean, populated by the kites of kite-boarders dancing in the wind. I've never been on a pure golf vacation before, but I can't imagine many nicer setups for golf addicts anywhere in the U.S. We're already planning to make this an annual trip.